Ensure food is handled safely and all HACCP requirements are met at each location with proper monitoring and compliance. HACCP (Hazard Analysis and Critical Control Points) is a systematic approach in which food safety is addressed through the analysis and control of biological, chemical, and physical hazards from raw material production, procurement, and handling, to manufacturing, distribution, and consumption. 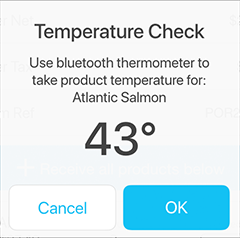 Automatically document food temperatures using Bluetooth temperature probes during cooking and cooling cycles. If the temperature recorded is outside acceptable limits, a corrective action will recommend to either increase/decrease the temperature or to dispose of the item if it is unsafe to eat. All HACCP-based logs are automatically created based on temperatures taken and tasks completed. Notify employees to reject items when delivered food is not within an acceptable range. Automatically monitor fridges and freezers and notify staff if temperatures rise above acceptable levels. Staff members are reminded if they failed to take the temperature of a specific food item or line. Assign tasks to employees to ensure all equipment is cleaned and maintained regularly. Require managers to digitally sign off once an employee completes all required HACCP-related tasks. 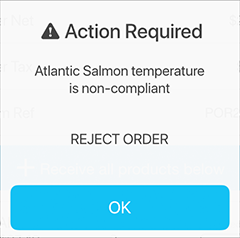 Require employees to enter the temperature of certain foods before accepting a delivery. Track if suppliers have multiple repeated food delivery temperature issues. See how SynergySuite seamlessly integrates with your POS system to analyze live data.